Cheeba Chews are here! These delicate, gluten free cannabis edibles were created in Colorado during the medical cannabis boom to answer the industry’s lack of consistency in edibles. Cheeba Chews were designed to be consistent, potent and discreet, and they certainly deliver in all three areas. 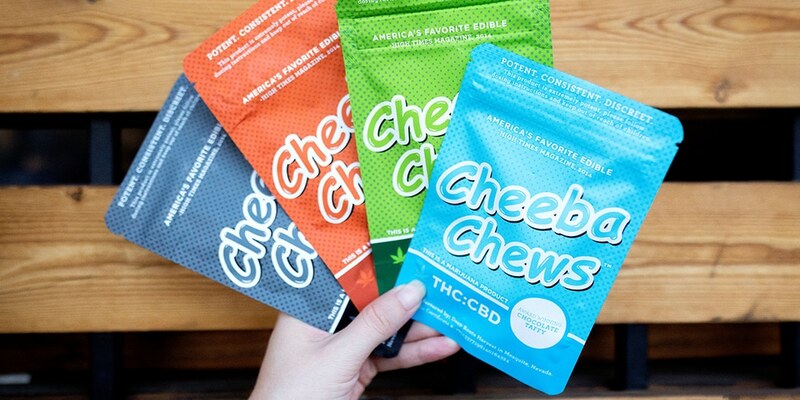 Each 10g piece of Cheeba Chew can be divided equally into 4 pieces, for a consistent dose of 15 mg of THC in every bite. Cheeba Chew side effects are similar to most edibles. Some may experience a body buzz, muscle relaxation, and an intense feeling of euphoria lasting 4-6 hours. Overconsumption can lead to paranoia, racing thoughts and manic behavior. Always begin with a small dose of Cheeba Chew; How much to eat will vary from person to person. Indica Cheeba Chews usually last for 5-6 hours and produce a wonderful sensation of relaxation, anxiety relief, and euphoria. Many consumers may prefer eating these alone at night while enjoying some relaxing music or a movie. Hybrid Cheeba Chews are a fantastic compromise for those who enjoy the sedative effects of an indica edible but also want to remain balanced and social. This chew is a perfect mix of both worlds. Sativa Cheeba Chews are the chosen edible of consumers who want daytime relief from chronic pain, nausea, tremors or the like, but also want to remain somewhat mentally sharp and functional. These chews are a great option for consumers who want to be productive and social in the daytime but still want to enjoy a euphoric buzz. CBD Cheeba Chews are an amazing pair for those who enjoy the anxiety and pain relief of CBD, while also reaping the benefits of THC therapy. These candies are amazing at controlling seizures, dulling pain, soothing the mind and presenting an overall sense of well being, while functioning with a relatively clear head. Recreational users may enjoy the “mellow” effects of these CBD chews as it still contains THC, though enough CBD to moderate the “high” feeling. Thrive Cannabis Marketplace proudly carries Cheeba Chews quad doses for both our medical marijuana patients and our recreational customers. Stop into one of our dispensaries Downtown or in North Las Vegas to experience any of our edibles for sale in Las Vegas. Have questions? We’ve got answers! Contact our stores for more information about Cheeba Chews, edibles and all things cannabis.